Steele was a pioneer who settled on the banks of the Des Plaines River in 1836 and is credited with being the first white permanent resident of River Forest. Steele and his wife, Harriet Dawley, brought their two sons and seven daughters to the "beautiful woodland skirting the shores of the river of the plains." Their home, built in a clearing of forest which is today just south of the Metra tracks and west of Thatcher Avenue, was lovingly furnished with mahogany pieces brought from the east, including the first piano in Chicago. The majority of their land is now owned by the Cook County Forest Preserve District. By 1842 Lake Street was one of the first planked roads in the area, connecting Chicago to Elgin. In 1846 Steele moved his family to a new home on the south side of Lake Street between the current Thatcher and Keystone Avenues. This building was known as Montezuma Hall and included a general store, tavern, post office, and stagecoach stop. Wayfarers could find refreshments for man and beast. Overnight guests paid 12 1/2 cents for a bed; breakfast was a quarter. Steele served as sheriff of Cook County in 1840 and became the local postmaster in 1849. A skilled tradesman, he built the landmark Harlem School on the northeast corner of Lake Street at Park Avenue in 1859. Today, that brick building serves as the administrative offices for the River Forest elementary schools. Trader, craftsman, builder, law-enforcement officer, and postmaster, Steele was a kind of Renaissance man. He was first buried on his own land but his body was moved to Forest Home Cemetery when his wife Harriet died. 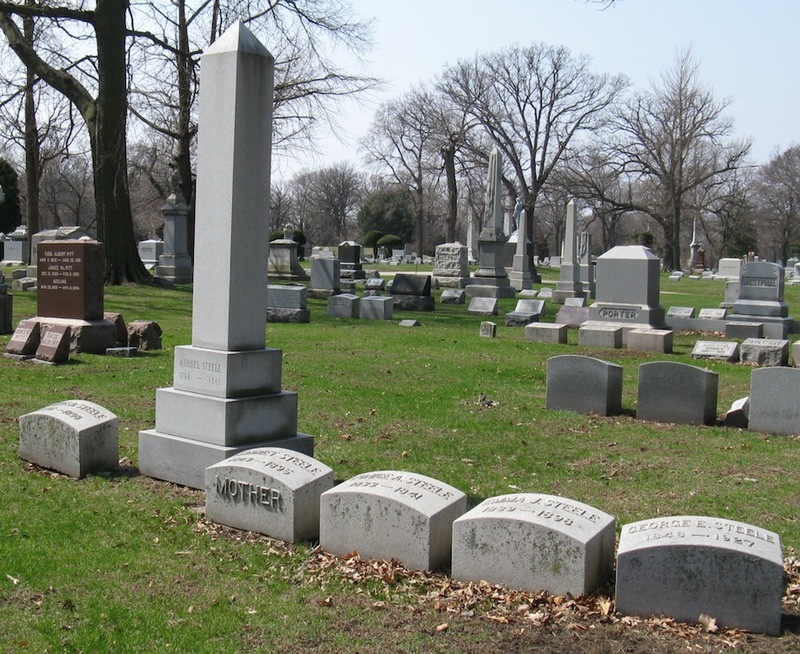 The Historical Society of Oak Park and River Forest raised more than $4,000 to purchase a new obelisk for his grave, as the original had crumbled beyond repair. The new stone was dedicated in September 1995.